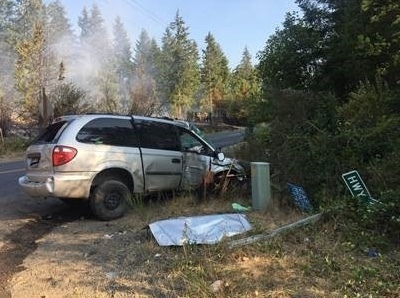 A suspected drunk driver caused a two-vehicle crash that killed three people Monday near Roy, according to the Washington State Patrol. The incident occurred around 4:15 p.m. at the intersection of State Route 702 and 8th Avenue South. According to the State Patrol, the driver of a Dodge Caravan was traveling south on 8th Avenue South when she ran a stop sign and hit a Toyota RAV4 that was heading west on SR 702. Three people inside the RAV4 were killed. The driver and a 4-year-old child were taken to nearby hospitals with serious injuries. The driver who caused the crash, a 36-year-old Lynnwood woman, was arrested on suspicion of driving under the influence and three counts of vehicular homicide. She was also taken to the hospital with injuries. The crash also started a brush fire that burned about 10 acres. A power pole was knocked down and the power lines dropped on dry brush and sparked a fire. The fire was quickly contained. Police said the road was blocked for more than six hours. The crash remains under investigation. Lawsuits stemming from a DUI are almost always more complex than a typical car accident. These crashes require more investigation and a deeper understanding of the law. Previous DUI arrests: If the person that caused the accident has a history of DUIs, there may be added value to your case. Dram shop liability: If the DUI driver that caused the accident was overserved at a restaurant or bar, the owner of that establishment may be liable under the Dram Shop Act. Serving or buying alcohol for a minor: If your accident was caused by an underage drunk driver, the person or establishment that provided the alcohol may be liable. This may add value to the case. Damages in a wrongful death case can total in the millions depending on the deceased and the circumstances of the incident. But generally, families of the deceased can recover financially for both the economic loss and the emotional loss of a loved one. At Davis Law Group, P.S., we are very experienced at handling wrongful death claims involving fatal car accidents, especially involving drunk drivers. Our legal team will promptly investigate the claim, preserve the evidence, identify the responsible parties and document the losses. Attorney Chris Davis and his staff always remain compassionate and understanding during this time of grief for the victim’s family. We are here for you. Discuss your case today with us to start the legal process. To schedule a free case evaluation, call (206) 727-4000, use the chat feature below or fill out the form on this page to get started. Information Is Power! Know Your Legal Rights! Need To Know More About Drunk Driving Collisions? Get Your FREE Copy of the Washington State Drunk Driving Collision Victim Handbook!! Need to know more about the laws surrounding drunk driving collisions? Attorney Chris Davis has written a FREE book about the nuances of accident and injury cases for drunk driving collisions. This book answers common legal questions that victims of drunk driving crashes and their loved ones may have about accident cases.